A recent article on the website Priceonomics.com entitled “The Mystery of California’s High Gas Prices” caught our attention this month because we have been writing about “the mystery” for some time. On July 25th, the retail price of gasoline nationally was $2.21 per gallon according to the Energy Information Agency…and then there was California – way above the national average. The story covered the usual suspects involved in explaining why Californians have been paying more for motor fuel than almost anybody in the nation since the 1990s…the California Air Resources Board (CARB), California fuel taxes and attempting to blame manipulation on the part of refiners and oil companies. But, instead of just pointing fingers, author Ben Christopher, out of Oakland, takes the time to spell out how much each component contributes to the states high fuel cost, which right now is roughly 50-cents per gallon higher than the national average. This is really a lesson in market economics, something virtually ignored by politicians in Sacramento and a lesson to all nationally of the effect of one-party rule. Since the mid-1990s the California Air Resources Board (CARB) has mandated a different gasoline blend than any other state, which the agency says is necessary to reduce pollution. They have changed the blend at least six times during the past 20 years, each time requiring all the in-state refiners to change their equipment and chemical additives, all of which drives up the cost at least a dime per gallon. In the recent past CARB has imposed requirements on the refiners to either reduce carbon emissions from their operations or buy pollution credits through the state-controlled quarterly cap-and-trade auction, another 10-to-12-cent per gallon cost. More CARB costs are in the offing, such as the “low carbon fuel standard,” which if met by 2020 is projected to raise fuel costs by as much as 50 percent according to several studies. As the first chart above shows, California’s total tax take on gasoline is a bit over 54-cents per gallon…at least a dime a gallon higher than the national average. All told, from fuel standards, to gas taxes, to emissions trading, California policy guarantees that its drivers pay an extra 32 cents more per gallon. As the Priceonomics.com article says, the rest of the price gap comes down to geography, quoting Michael Green, public relations director at AAA. Much of the country’s oil refining capacity is dotted along the Gulf Coast. When any one of California’s 17 refineries hits a production snag, imports have to make up the difference and imports aren’t cheap. “There are no pipelines that go over the Rocky Mountains,” he says, which is why gasoline prices are predictably higher across the American West. “Maybe [imported gas] comes from Asia, maybe it comes through the Panama Canal, maybe it comes from Mexico. Either way, those transportation costs get passed along to consumers.” Basically, from a supply side, California might as well be on an island because the state either produces what it needs or must rely on pricey imports. And that, says Green, is all there is to it. No shady dealings by money grubbing oligopolists in the refining market required. It would be different if new refiners moved into the state, but given the environmental opposition to such a plan, citizens will continue to pay more. A new refinery has not been built in California since Jerry Brown’s first term (1975) when the state’s population was half of what it is now. 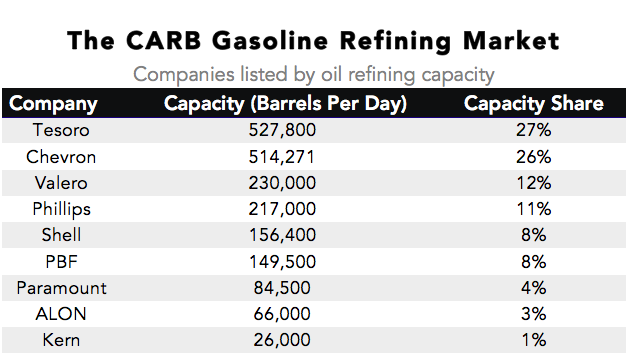 It’s more of a mystery how the refiners have managed to keep nearly 39 million people supplied with motor fuel considering the obstacles regulators keep putting in their way. Econ 101: Por qué California tiene los precios más altos de Gasolina en el... Is Citizenship A Requirement For CDL?